Press pie crust into a tart pan. You will need both crusts. One will fit along the bottom of the pie pan, and you can cut strips from the other pie round to press against the sides of the tart pan. In a large bowl, beat together the pumpkin puree, sugar, eggs and pumpkin pie spice. Spoon all but 1/4 cup of the mixture into the pie crust. Add the cream cheese, cocoa powder and powdered sugar to the remaining pumpkin puree. Beat until smooth. Transfer cocoa mixture into a plastic zip-top bag. Cut a small portion from the corner and pipe 5 circles around the tart, from the outside to the inside. 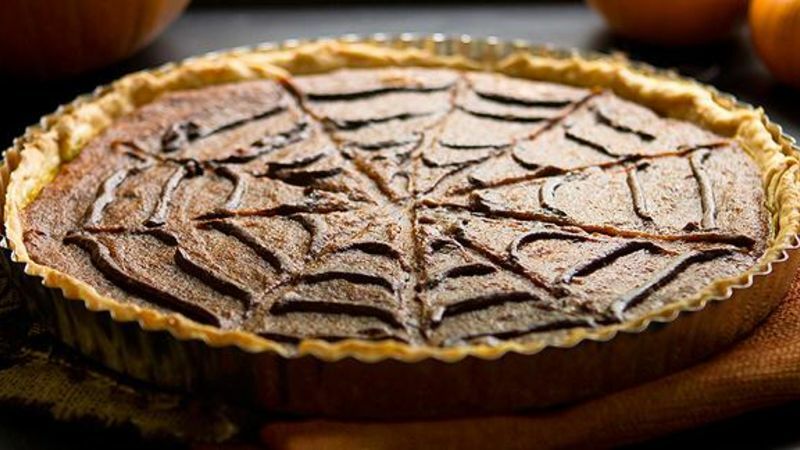 Use a knife and drag it from the center of the tart to the outside in 8-10 places to create the spiderweb effect. Bake in preheated oven for 25-30 minutes, or until the pumpkin mixture is set. Remove and cool completely. Top with plastic spiders before serving for an extra fun way to serve this yummy dessert. This fun pumpkin tart is dressed to impress your October guests. Six simple ingredients and you've got yourself a yummy Spiderweb Pumpkin Tart – just in time for Halloween! There's something spooky, but oh-so delish, about this pumpkin tart. It's so simple, and such a fun dessert to bring to a party or serve to friends. Start with a few seriously basic ingredients. Eggs, pumpkin, pretty pretty pie crust. Life is so nice in the autumn, isn't it? Unroll the pie crust into your tart pan. You'll need both pie crusts to completely cover the tart pan. Just lay one pie dough round on the bottom of the tart pan, then slice the second into 1" slices and press them against the edges to get a nice, tarty tart. Now fill it all with a sweet pumpkin custard mixture. Sugar, eggs, pumpkin pie spice, pumpkin. That's it! That's seriously all that goes in there. But how does it taste? Oh, honey. As if you'd doubt this flava. We've got you covered, this little ditty is diviiiine once cooked. With the pumpkin filling all prepped and in place, you're gonna whip up a little chocolate cream cheese spiderweb weaver. That's not a thing. Just go with it. The chocolate cream cheese weaver thinger gets piped up top the tart. Then, a straw drags gently through to create a wondrous little spiderweb. Bake and you're ready to share! Want to make it even cuter than it already is? Place some little plastic spiders atop your tart for garnish. Or serve up slices with mini pumpkins or a dollop of whipped cream!